2014 marks the third edition of UIA-HYP Cup International Student Competition in Architectural Design. 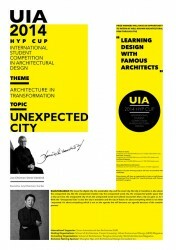 As the exclusive annual international student competition in Mainland China sponsored by UIA (Union International des Architects), HYP Cup competition has provided a platform for architectural schools and students from different countries to exchange ideas on current architecture issues in relation to environment, specific sites, and urban spaces. With its challenging topics, professional committee and jury as well as thorough organizing, HYP Cup competition has attracted students from all different countries to actively participate, and become one of the largest and most professional student competitions. Its influence and outreach has raised significantly throughout the globe. The competition of this year continues to focus on the theme of “Architecture in Transformation” with the topic “Unexpected City” decided by Daniel Libeskind, Chairman of the jury. Daniel Libeskind elaborates the topic as follows: We know the digital city, the sustainable city, and the smart city. But city in transition is also about the unexpected city, like the unexpected creative city, the unexpected social city, the unexpected public space that a city can have, the unexpected city of art, the unexpected social and cultural encounters that a city can give us. So I think the “Unexpected City” is also the city in transition and the city of future. It’s about everything which is not what I expected. It’s about everything which is not on the agenda but will become our agenda because of the creative process. 3. Total floor area is around 4,000 ㎡. It may be increased or decreased up to around 10% according to the designer. 4. Language and Measurement Unit: English is the official language of the competition. (Note: The title, school name, name of participants, and introduction of design must be described in English at least); the unit of measurement is metric scale. Exclusive Naming Sponsor: Shanghai Hyp-arch Architectural Design Consultant Inc.
Prize winners will have an opportunity to intern at well-known architectural firm through the “Learning Design with Famous Architects” program. This is a fair competition for which both Chinese and international college students can sign up. Full-time on-campus students (including graduate students and Ph.D Candidates) can participate alone or as a team with team members of no more than 4 people and advisors of no more than 2. 1. Log on http://hypcup2014.uedmagazine.net/Eg_index.php, click “Online Registration“ to fill-in the registration form and submit online. Please keep the only serial number well. 2. The registration deadline is June 30, 2014, and it is free to register. before August 31, 2014. The committee doesn’t accept any printed works. All entries will be printed and exhibited in September, 2014. 4. The jury will have meetings and decide the winners. 5. The committee will announce the winners in September 2014. In December 2014, the winning entries will be exhibited and there will be a prize-awarding ceremony. 3. Documents: Recognizable scanned copy of passport, student card should be attached in the e-mail. The students themselves are responsible for the authenticity of the documents. a. Specification: The layout of the 841mm x 594mm drawing should be horizontal. Each work should be composed of 3 drawings. b. Content: Site-plan that can fully express the design intention; plans, elevations and sections; perspective drawing, illustration and a design description of about 500 words (integrated in the pictures and drawings). There is no limitation on proportion. c. A TXT document must be attached in the e-mails of the submission, included in which are the name of the participant, registration number, e-mail address, mobile phone number, name and contact information of the advisor (if have any), the full name of the school and department, title and brief introduction of the design work. 1. Individual participants and groups must agree with and follow the competition regulations announced. 2. Any words or pictures relating to the name or department of participants are not allowed in the digital drawings. Anyone who does not conform to the regulations is disqualified from the competition. 3. Participants hold the copyright of the entry, but competition organizers, the UIA and investment units are entitled to use images of the entries to publicize the results of the competition, or in any publications. 4. Works that have entered other competitions, adopted design ideas of others or been published in other public occasions are disqualified for the competition.